Once again, it is Random Acts of Kindness week. It is always held around Valentine’s Day, as kindness is associated with the virtue of love. 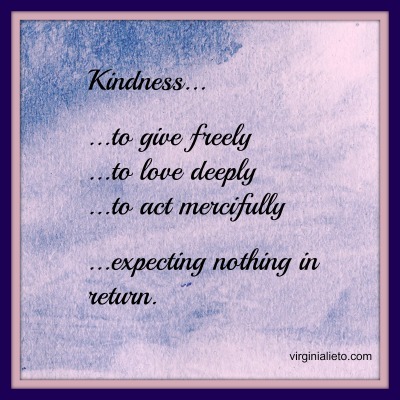 I’m a big fan of Random Acts of Kindness Week, because it always brings me and others great joy to do something nice for someone else, expecting nothing in return. Surprise the love of your life with a special meal; perhaps it involves home cooking your love’s favorite foods, or perhaps it is dinner at your love’s favorite restaurant. Either way, the love of your life will be made to feel great. Refrain from scolding your children/spouse and exert patience along with kindness. Sometimes it is better to be kind than to be right.